A couple of weeks ago, I was fortunate enough to attend a Shakespeare Festival in a small town down south. DH and I have gone three times in the last few years, as children and time off work permitted, and each time it's been an utter delight. This year we went with some good friends so it was twice as fun. One afternoon we were in between plays, and I was determined to get back to this little used bookstore we'd visited the last time we made it down. For many years now, I have been involved in a prolonged and illustrious love affair with used bookstores. This one is my latest crush. 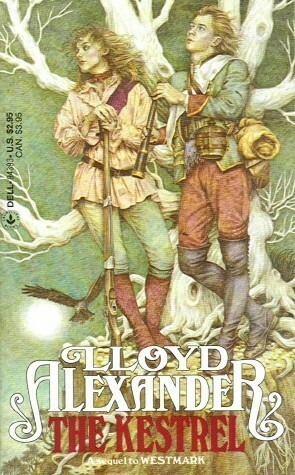 I walked in the door, wandered over to the YA section, and lo and behold the exact edition of Lloyd Alexander's The Black Cauldron that I have been searching for for what feels like forever--the one missing from my collection--was sitting there on the shelf in gorgeous condition with a price tag of two dollars. Needless to say I snatched it up immediately and the smile it put on my face has lasted. It also put me in mind of another Alexander book I wanted to review. I love all his books (as you know), and the Chronicles of Prydain will always hold a place of honor in my heart as they were the first of his I read and I'm finishing up the last one with my son right now. But the Westmark series is something special. I reviewed book one awhile back (it's actually the only Alexander book I've reviewed on the blog which fills me with shock and dismay), so today you get book two. And you may be getting more in the near future. Warning: It's always a bit hard avoiding spoilers when reviewing sequels. So please proceed with caution if you have not yet read Westmark. 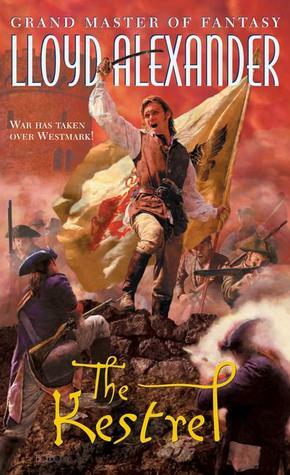 Instead ask yourself, "Whyever have I not read Westmark?" And then go remedy the situation immediately. Theo is lost. Geographically he knows exactly where he is. He's crisscrossing the country, getting to know every nook and cranny of the land he is to rule over with Mickle. Mickle--the girl who was nothing more than a guttersnipe thief. The girl he fell in love with who turned out to be a princess and heir to the throne of the beleaguered kingdom of Westmark. Now he is set to become prince-consort, and Theo is as far from knowing where he is or being sure that's who he should be as is humanly possible. Mickle (or rather the Princess Augusta) is stuck in the capital city, regaining the life she lost as a small girl, while Theo is forced to see his nation and his people for what they really are--toppling over the brink of revolution. Tasked with reporting the findings of his wanderings to the royal family, Theo soon realizes he will be fortunate to survive at all. And before long, he isn't at all sure he wants to as his life is changed irrevocably by a single gunshot. Little does he know, back at the capital Mickle's life has been equally as altered. Determined to find Theo, she sets off on a dangerous adventure of her own. By the time she locates him, however, Theo is changed far beyond recognition. Whether they will be able to return to some sort of common ground is only one of a thousand questions raging along with the war. 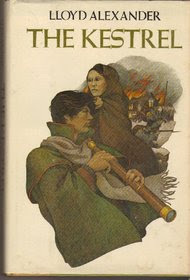 First published in 1982, The Kestrel is the best kind of historical fantasy. It is also everything the middle novel in a trilogy should be. And by that I mean it is darker, more ambiguous, painstakingly layered, more political, just altogether more. I remember the first time I read it being so afraid for Theo. He was one thing in the first book, and here he was being violently forced into being another thing. I was so afraid he wouldn't survive. Lloyd Alexander is a master of character evolution and at asking the hard questions. Theo begins to believe he is the Kestrel, that the feared soldier, the learned and later craved violence, is the real him. That the printer's apprentice of his youth is a mere memory, a boy he thought he was. It was one of the first times I came up against a character confronting himself and not being sure which facet of his personality was the genuine one. I have not forgotten the experience and only learned to appreciate it more for its brutal honesty in the years since. Fortunately, Mr. Alexander is brilliant at wry humor and love as well. So you're never left entirely without recourse when the demons come calling. Mickle is pure gold in this book, and she will always be one of my very favorite fictional thieves. Her ability to know who she is and meld the two aspects of her broken life provide inspiration and lifeline to Theo and the reader as the tale wends its way to its excellent close. I always recommend this for those in the mood for some more mature character-driven YA fantasy with an emphasis on the political rather than the fantastical. Well. I just ordered it. How do you have this power over me?!? Mwa-ha-ha!! I am thinking you will be enjoying this trilogy. Please to keep me posted. Lloyd Alexander is the best. But it's the Chronicles of Pyrdain that have the special place in my heart. He is the best. And the Chronicles of Prydain will always be the specialest. But I enjoy touting this series just because fewer people are aware of it and I do think the characters are worthy of a wider readership. It can be pretty agonizing, you're right. And Taran Wanderer is such a book. Just finished it with Will and he absolutely loved it. Okay I didn't read the review part to avoid spoilers, because I have to admit that I haven't read any Lloyd Alexander, but am questioning myself about that most urgently as we speak. Would you recommend starting with Westmark or The Book of Three? I realize the latter series has much more acclaim (and therefore many more of my Goodreads friends have read/rated it), but I like that this one is darker. You know, I would recommend starting with Westmark. For adults coming to Alexander for the first time I tend to. It's more mature, more complicated, but still retains the wonderful humor and incomparable characters he excels at. Think you'd like. It was fabulous, Heidi. We got to see three plays and visit the used bookstore. The Merry Wives of Windsor was stellar. And the bookstore is a balm for the soul.